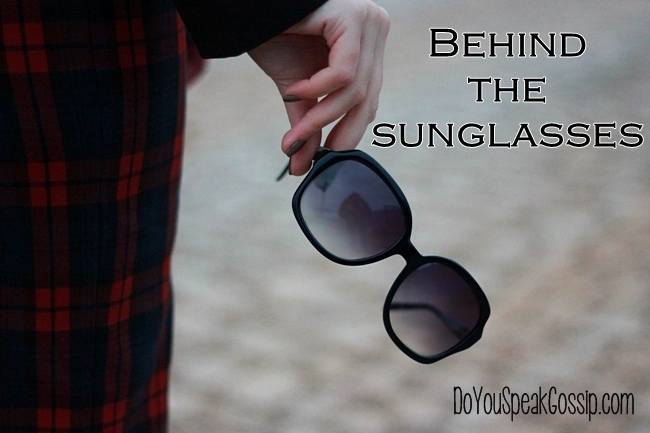 I wear my sunglasses at night - Do You Speak Gossip?Do You Speak Gossip? No actually I don’t. Cause that would be weird. In fact I didn’t have my sunglasses with me and that’s why I, once again, pasted my cartoonish sunglasses on my face. I’m sure you know by now that I never reveal my whole face on the internet. Call me weird or suspicious, but I still have some boundaries about giving away my personal info, even though I’ve already given away too much by creating this blog, and furthermore by posting photos of myself and my outfits on the internet. Eyes are the windows to the soul, they say, and there are not only good people out there. You never know. Anyway, no offense to those of you who do reveal your faces, I don’t have a problem with that of course, do as you please. It’s only MY weirdness. So, moving on to the outfit part, these pics were taken almost about a week ago, on a cold, windy night, and I needed to wear something to keep me warm. That’s why I went with a more casual/cozy outfit, giving emphasis on the shoes by letting them be the star of the outfit. You can see some of the stores of the mall behind me. I also took some photos of their windows with the Christmas decorations. 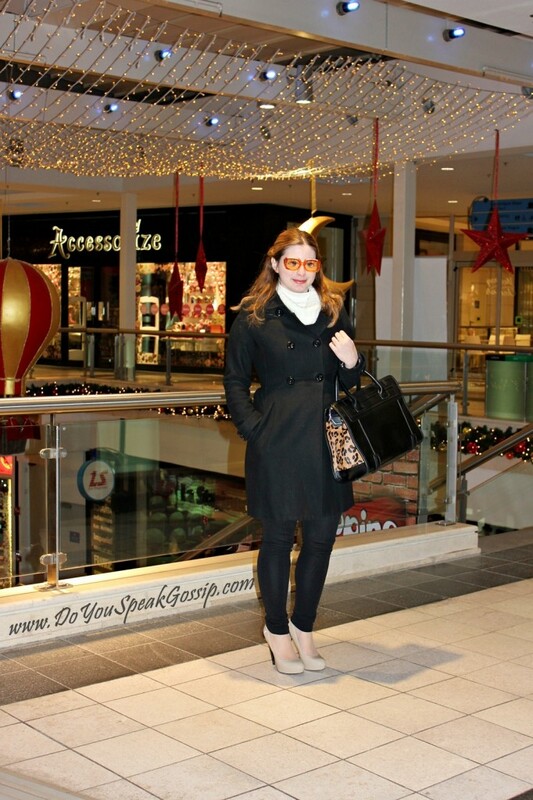 Wearing: Pepe Jeans coat, Lussile turtleneck (with a black body underneath – it was reallyyyy cold! ), Stradivarius long sweater, Sarah Lawrence leggings, Zara bag, Tsakiris Mallas pumps and vintage necklace. On my nails: Seventeen no. 79 (old) – Bordeaux. It was the first time I used my new bag, and I loved it. It’s really big and I could easily fit in my camera with its own bag, and still have room for my things. And even though it was night, I didn’t hesitate to take such a big bag with me. I’m sure you’ll see it more often from now on. For the end, a close up of the shoes, which are being shown for the first time in an outfit here on the blog. We’re getting closer to Christmas, so I have a little surprise for you on my next post, because I think you liked my gift guides. So I may have a few ideas for outfits you could wear to parties during the holidays. Muhahaha this post is really funny 😀 I like it! Iliyana recently posted..Yellow submarine, yellow submarine, yellow submerine…. I love your shoes and that bag!! Great outfit, very classy! Mandy@OrangeAutumn recently posted..We Have a Winner! I loved the post! It was very sweet, with the orange “sunglasses”! And there’s no way to make you ugly – even then you looked beautiful and elegant as always! I simply loved this outfit! It’s so absoutely elegant, you look like a millionaire who just wanted some small things to have a happier day, and then you went to the Mall to buy a diamond bracelet! Well, that was the image that came to my mind, cause your outfit is really classy! I also liked the bag very much! At first I thought it was a D & G bag, cause it looks of extreme quality, but then you said Zara, wow! Great choice! I am curious to see your picks for Christmas! I’m sure I’ll be dreaming of some outfits! I certainly hope that you can buy a pair of Tsakiris Mallas’ pumps in person next year. The thing is they don’t deliever at all. Not even in Greece. You can buy them only at the stores. And their prices aren’t so cheap either. But they do have more affordable lines. I know you’ve already found your perfect dress for New Year’s but I still haven’t and I needed some inspiration, so I made my next post. And I hope it inspires many other of my lovely readers. totally loving those heels! they seem to have just the right amount of platform. oomph. recently posted..guest post: beauty and the beach. They’re actually quite high, and it was really difficult at first to walk in them, but I got used to them since last year. However, they are almost 14cm with about 3-4cm platform, and I still haven’t worn them as much as I want to. But I’ll do it this year for sure. Oh, lady you look so chic and wonderful. Thank you so much my sweet Ramona! I’m glad you don’t mind my “silly sunglasses”. μ’αρεσει παρα πολυ η τσαντα κ οι γοβες! S’euxaristw para poli! Kai gia to comment sou kai gia to follow! Thank you so much Steph! I know that the “sunglasses” don’t hide my face really well (thank you for your beautiful comment), but it would be much more impersonal to hide the whole face. I tried when I started posting my outfits, but didn’t like it. That’s why I usually wear my real sunglasses in every post. *ηθελα να σε ευχαριστησω για τα σχολια σου κιολας στο blog μου το εκτιμω πολυ κ χαιρομαι που βλεπω οτι σαρεσουν οι αναρτησεις μου! caramellitsa recently posted..Πώς να φτιάξετε ενυδατική κρέμα Σώματος!Make a homemade body butter! Parakalw, den kanei tipota…Kai egw xairomai na se vlepw sto blog mou, kai eilikrina xairomai poli otan sas aresoune auta pou postarw. Kai esi na eisai kala! Exo ena palto mauro sxedon idio me to diko sou!!! Filia, kai KALES GIORTES glikia mou!!!! S’euxaristw poli Vanda! Na’sai kala! super teleia!kala i tsanata k t papoytsia s einai latremena opws panta!! Great outfit,hon!I absolutely love the shoes! Πολύ όμορφο ντύσιμο!! Οι γόβες ειδικά τέλειες!! Σε καταλαβαίνω και κατανοώ πως δεν θέλεις να δείξεις το πρόσωπο σου, δεν είναι κακό! Πάντως είσαι κούκλα και αυτό φαίνεται.. Τα γυαλιά είναι μια πολύ ωραία καρτουνίστικη ιδέα!! Να κάνεις αυτό που σε εκφράζει καλή μου!! Μοντέρνα Σταχτοπούτα recently posted..MAC : Η νεά συλλογή καλλυντικών MAC & Iris Apfel Χειμώνας 2012. Kalo savvatokiriako kai se sena! Mallon, kali kiriaki pleon. hehe Filia! Ooh I happen to love your cartoon sunglasses! 😉 This is a lovely look – that bag is purrrfect! I guess it is really clever to put the cartoonish glasses on. But your outfit looked good on you. And the clothes are really perfect especially if it is colder night. With or without the blazer, the clothes could really complement your figure and the color looked nice. Looking forward to see the gift guide next time. Such a nice outfit. Love the Zara bag, and those pumps are lovely as well. S’euxaristw poli kai pali Marianne! Poli xairomai pou sou arese to outfit mou. ax teleio palto!k mu aresei poly k to efe pou xionizei i othoni!fainetai oti anypomonw na elthun ta xristougenna e? Kai egw anipomonwwww!!! S’euxaristw poli, xairomai pou sou aresan! Thank you all for your really sweet comments. Glad you liked my outfit, and you that you didn’t mind my silly “sunglasses”. Its been said already above but I wanted to echo that those shoes are amazing!